A gorgeous arm chair from which to enjoy many welcoming, delicious gatherings, meals and memories. When you think of a Spanish or Mexican hacienda, isn’t one of the first things that comes to your mind a sense of abundance, working, sharing, being with others? That is definitely the case for me. And a hacienda-feel home, whether in Mexico, Spain, Texas, Colorado or Santa Barbara … needs a table setting worthy of this warmth, wealth and hospitality. 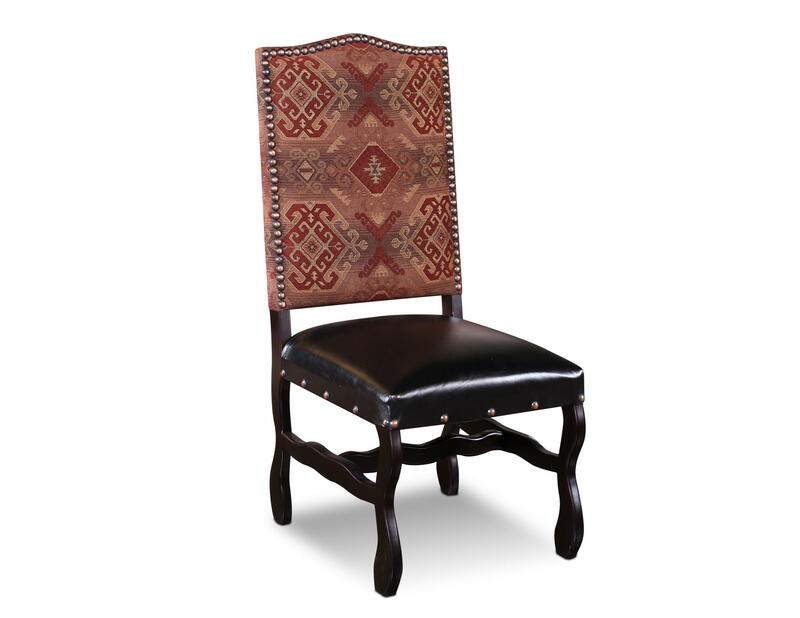 For those lucky guests to be invited to sit around the Hacienda Tuscan Dining Table, we have the perfect chair! Beautiful curved legs, comfortable back in bonded leather or upholstery, large nail heads and, in my humble opinion, a princely stature! Sturdy solid kiln dried pine, rich dark finish, beautiful turned legs, large nail heads. 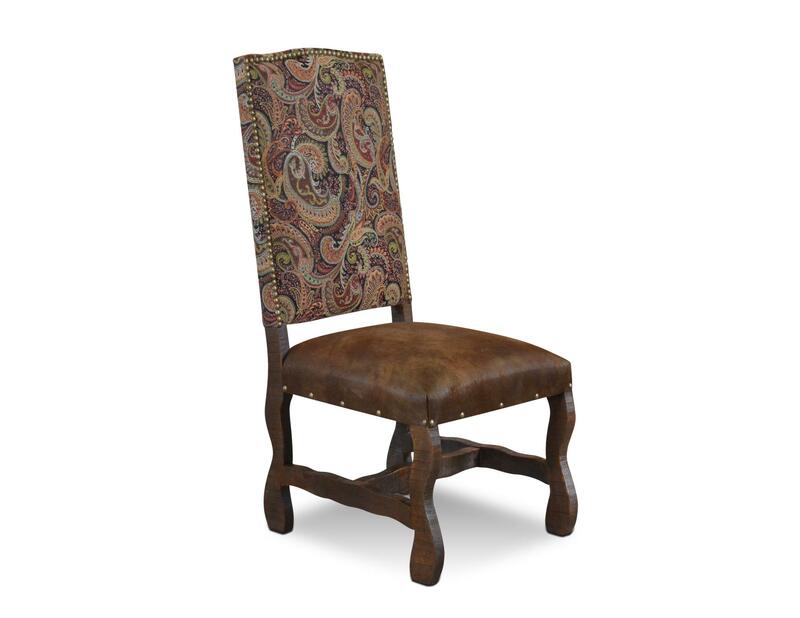 A gorgeous chair worthy of many welcoming, delicious gatherings, meals and memories. Note our available fabrics change from time to time. If you love the chair, but not the fabric ask about alternatives. 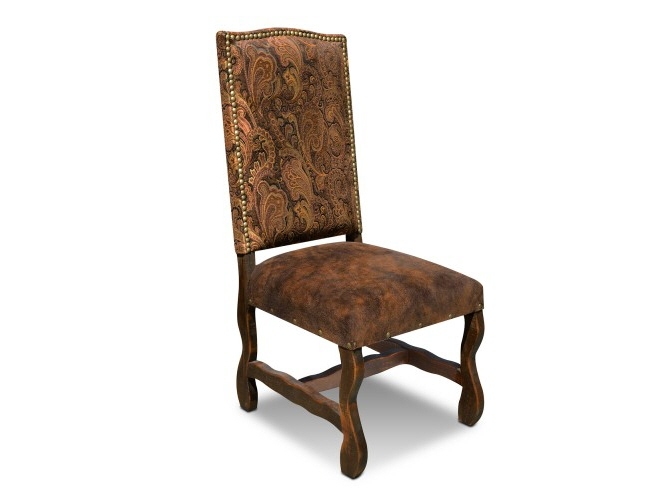 Other items in our Hacienda Tuscan collection include: Hacienda Tuscan Table, Arm Chair, Sofa, Counter Stool, Credenza.